A fight between two men at a North County convenience store escalated Friday into a stabbing that left one of them hospitalized and the other under arrest. 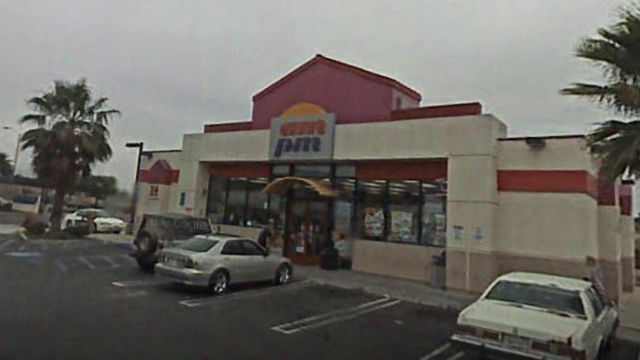 The 9:30 a.m. fracas occured at the ampm in the 1500 block of Melrose Drive, Oceanside Police Lt. Kedrick Sadler said. Following the stabbing, the assailant fled on foot and medics took the victim to a trauma center, where he was admitted in stable condition with wounds to his upper body, according to Sadler. Officers searched the area with help from a San Diego Sheriff’s patrol helicopter, eventually finding the suspect at a business in the 700 block of North Avenue in Vista, several blocks south of the location of the assault. The alleged assailant, whose name was not immediately available, was taken into custody without incident about 11:15 a.m., the lieutenant said.